Two Nottinghamshire business neighbours have been named in the top 200 fastest growing East Midlands companies. Woodhead and Alkane Energy are both based in Edwinstowe House, an enterprise centre in the heart of Edwinstowe. This unique insight into the financial performance of the East Midlands business community was awarded by Grant Thornton, in partnership with the CBI (Confederation of British Industry). Woodhead specialises in the design, construction, refurbishment, conservation and repairs and maintenance of buildings. Earlier this year the company were awarded the East Midlands Contractor of the Year by the Chartered Institute of Building. The company which expects to turn over in excess of £26m this year, is joined in the Top 200 by neighbouring business, Alkane Energy – based in the same building, just feet apart. Alkane is one of the UK’s fastest growing independent power generators, and recently won the Business Excellence Award 2014 Growth Award: Independent Power Generator of the Year – UK. The Company operates mid-sized “gas to power” electricity plants providing both base load and fast response capacity to the grid. Alkane now has a total of 90MW of installed generating capacity and an electricity grid capacity of 110MW. Edwinstowe House currently has business units available for businesses of varying size, looking to benefit from being a part of this thriving business community. The building contains over 130 flexible and serviced offices, varying in size from 90ft² through to 5,000ft. office accommodation. The enterprise centre is owned by Woodhead (Holdings) Limited following its purchase in November last year as part of the company’s ongoing commitment to Nottingham and Nottinghamshire. Ideally located for the East Midlands and South Yorkshire, with easy links to the M1 and A1, Edwinstowe House offers businesses a professional reception service, restaurant, professional answering service and high speed broadband capacity, not to mention free parking for staff and visitors. It also provides conference & meeting rooms for up to 120 delegates. Businesses interested in planning a conference or leasing offices in Edwinstowe House should call 01623 827 900 or visit the website: www.edwinstowehouse.co.uk for more information. 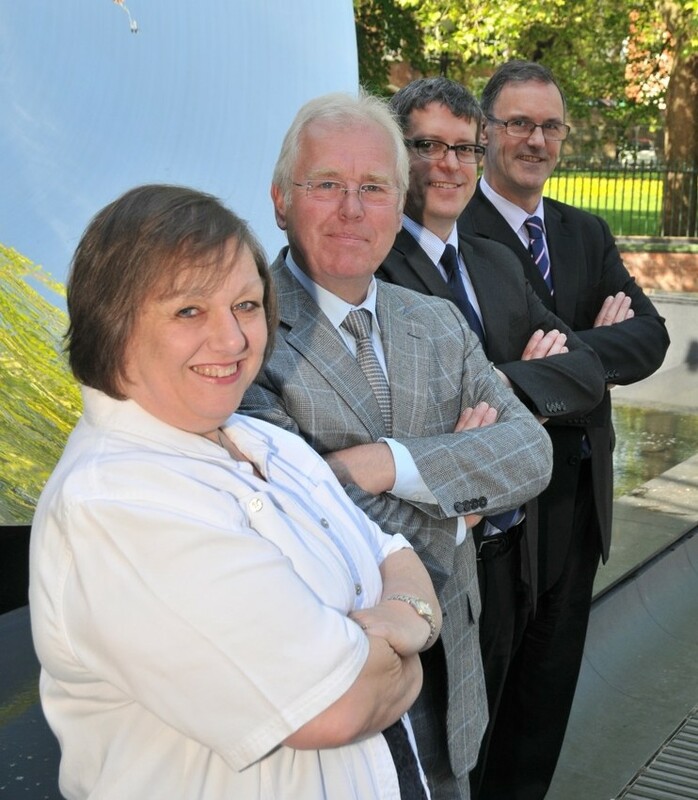 Pictured: Woodhead Directors (Front to back) Hilary Cheshire, Financial Director, Derek McGrath, Director, Glenn Slater, Business Development Director, David Woodhead, Managing Director.